Vicente (Eusebio) Assensio (Sáez) was a craftsman and scientist who worked within the canons established by the Enlightenment, studying widely in search of scientific rigor. He was employed as both a violin maker and an astronomer, and had also taken holy orders: he appears in sources listed as ‘El curita’ or ‘El cura’ (‘the little priest’ or ‘the priest’) and signed his labels with the word ‘Pxesb’ (for ‘presbitero’). Assensio was born on December 15, 1730 in Fuentelaencina, a small town in the province of Guadalajara, 60km north-east of Madrid. Nothing is known about his early training, but we presume he arrived in Madrid in the 1760s, shortly after it had become the capital of Spain, in search of wider opportunities to develop his skills and to learn more about precision instruments. There is no mention made of him after 1798, so we assume that his death occurred around that year. Assensio entered the service of the Spanish royal household in 1776, working as a violin maker and repairer as well as an optician and astronomer to Prince Charles IV. As noted by the historian Vicente Vela, there are few records of Assensio’s scientific activities between 1760 and 1787, but his work in astronomy is evidenced by the existence of a catadioptric telescope made by him in 1787 (now displayed in the Naval Museum of Madrid) as well as receipts for repairs he carried out on telescopes belonging to the opticians James Short and John Dollond in 1789 and 1790. He is also known for various inventions, including a seed drill and a lathe for winding strings. In 1776 the ageing José Contreras still held the post of Master of Violins to Charles IV and he continued to carry out work for the prince until at least 1777, when he requested financial assistance due to illness. It seems that this created some competition between the two possible candidates: José Melitón Contreras (Contreras’s son), whose application for the post dated 1775 can be found in the archive of the Madrid Royal Palace; and Vicente Assensio, who was awarded the position according to a document in the hand of Silverio Ortega (Assensio’s nephew) in which he stated that he had taken over his uncle’s post, who ‘left it owing to total incapacity having served His Majesty for a period of sixteen years’. Assensio’s output appears to have been relatively small: his last known instrument dates from 1791 and is numbered only 31, and his work is very rare today. This is probably connected with his dual role as repairer. References to Assensio in the royal household accounts mostly use the term ‘compostura’, which could cover anything from small repairs to far-reaching alterations undertaken to improve the sound and ‘modernize’ the instruments. Due to his position at the Spanish court, Assensio would have been familiar with Cremonese instruments; however, his work cannot be described as copies of the originals, but rather interpretations of them based on his own notions. 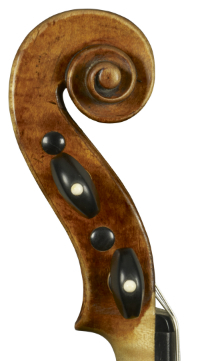 Elements of Amati and Stainer are combined with a few Stradivarian ideas, but with distinctly personal touches such as his f-holes, which have notches in the Roman style and are sometimes oversized. His varnish varies between a very light gold and a dark red–brown color, and his instruments are distinctively branded on the button ‘AV’ (with the V superimposed over the A). Internally the center linings are morticed to the blocks and the interior structure is of pine in the Amati style. An external mould survives with an inscription that reads: ‘Violin mould made in the style of Antonio and Hieronymus Amati by Dom Vicente Assensio in 1776’. 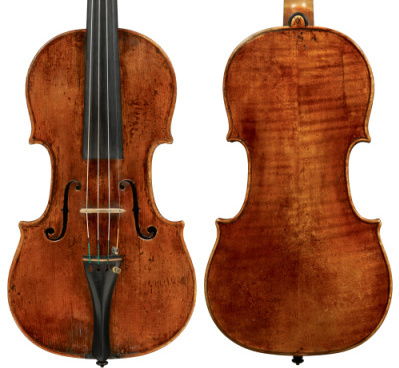 All known Assensio violins fit the dimensions of this mould perfectly or very closely, suggesting that despite his familiarity with the work of Contreras, he was unable or unwilling to follow Contreras’s departure from the Amati tradition in favor of Stradivari. Charles IV’s collection already contained instruments commissioned from Contreras in 1762 and 1767, and one theory is that Assensio continued making in the old style in an attempt to please a prince who stated that he loved playing on his ‘favorite Amati’ violin. Spanish cellist and violin maker Jorge Pozas is editor of ‘The Golden Age of Violin Making in Spain’, published in 2014.